Other research and industrial applications. 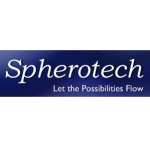 Spherotech specializes in microparticle research and development. We constantly introduce new products and improve the existing portfolio. Our loyal customers value Spherotech’s agile manufacturing capabilities, custom OEM particle solutions, and value-add supply options. Our manufacturing facilities can accommodate multi-liter lot sizes of our entire microsphere offering. While we publish an overview of our products, it is by no means comprehensive. If the particle you require is not listed, we urge you to contact our team to check our complete inventory. World class quality and technical support are standard practice. As an ISO 9001:2008 registered company, we consistently meet or exceed customer expectations. Spherotech’s scientists look forward to meeting your application specific requirements in microparticle technology.